No. 142 is well located with off street parking, plus a locked garage with internal access. All linen/furnishings are either 100% cotton or linen to add to the luxury feeling. Feather pillows and duvets, with the option of synthetic due to allergies. Double sofa bed with innerspring and pillow top is located in the separate lounge. Air Conditioning with ducts to all rooms, keeps the house at an even temperature. We have a secure, private backyard for you to sit under the olive trees and enjoy a bbq, glass of wine and entertain. If it is just a quiet cup of tea in the morning, there is a place for you. A complete kitchen, if you decide you need to cook that special meal. Supermarket is a couple of minutes away. Sky television along with Netflix and of course unlimited wifi. Two mountain bikes available for use. If it is golf, cycling, rowing, holiday or visiting one of the many attractions near this Waikato town consider staying a few nights and enjoy what is to offer. A quiet stroll to the cafes for breakfast or dinner, or maybe a movie. Garage plus Parking on driveway and off road parking on centre grass strip. Garage with remote control plus internal access. We have lawn and garden front and back of the villa. The back garden contains furniture and a BBQ plus a deck with furniture, it is also private and secluded and locked off so children can play. Two mountain bikes with helmets are available for guests. If more are required they can be hired from the I Site, which is a walk down the street from the villa. What a beautiful villa to stay at. Very clean, tidy, warm and had everything we needed. The villa was so beautifully presented. Handy to cafes and shops. Yvonne, thank you for being so lovely to deal with and understanding. If we are ever in Cambridge again, I would love to come and stay at Villa 142. Villa 142 is a fantastic property and would top our list - really lovely styling and very comfortable and homely. It has everything you need for rest and relaxation and if you'd like to self-cater. That said it is in close proximity to cafes and shops if you're looking for convenience. I stayed here with my husband, 2 kids, mother and brother and it was perfect. It's spacious, beautifully-decorated and in a great location. Yvonne had the spare bed all set up in one of the larger bedrooms for us upon arrival. She was available via text the entire time we were staying in the house. The location is great, central to Rotorua and Waitomo if you plan to go to those places. We did both of those on separate days and it is about an hour drive to each. Hamilton is also a nice town that is close to Cambridge. There's a nice little backyard as well with a grill and space for the kids to run around. The kitchen is also well-appointed and we had all we needed to cook breakfast and dinner each day. Yvonne was also kind enough to provide some essentials, including fresh eggs, milk, butter and bread. Overall a fantastic stay at a wonderful property. Would highly recommend a stay here if you're planning to be in the area. This property is luxurious. So warm, clean and functional. All three rooms had plenty of warm bedding available and the central heating meant the whole house felt cosy and inviting. 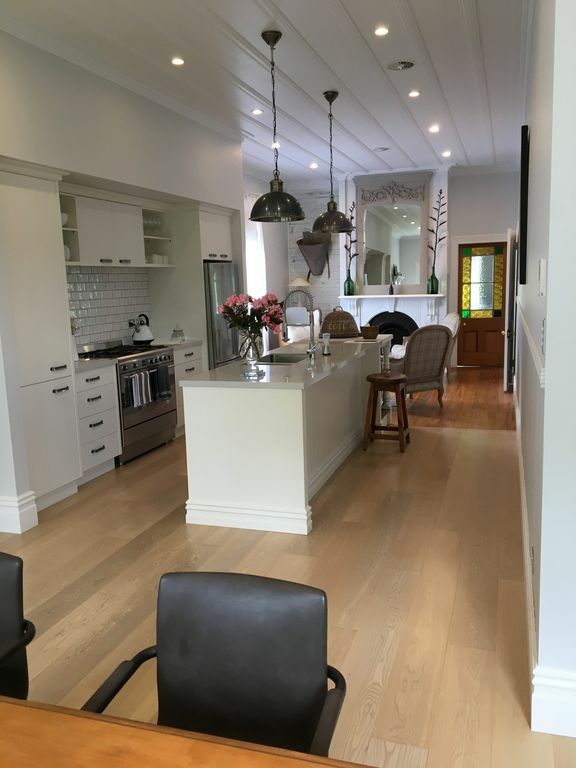 They have done an absolutely beautiful, high quality renovation on this property and I would not hesitate to recommend it to anyone. The perfect place to stay if visiting Cambridge. The perfect place to stay if visiting Cambridge. We have stayed a few times and love the cottage!